(Beat Goes On) 35 Tracks - All these albums from 1973, 1974 and 1975 reached the Top 200 of the USA. The single"(Just Like) Romeo And Juliet" was a hit on the radio. Since their foundation in 1969 the rock'n'roll tribute band Sha Na Na still enthuses their audience. Digital remastered and with new liner notes. Sha Na Na parlayed their straight-ahead '50s rock & roll revivalism into a successful touring career, even if they were never as popular on record as they were live. The group's image and style were unabashedly anachronistic, as they covered '50s pop and doo wop standards, slicked their hair back in the greaser fashion, and dressed in flamboyant '50s costumes. 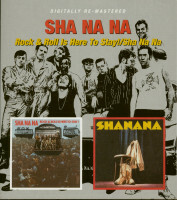 Sha Na Na formed at Columbia University in 1968 and quickly built a name for themselves with live performances, often at the Fillmore East, featuring such theatrics as a dance contest for audience members. The original lineup consisted of vocalists Rob Leonard, Scott Powell, Johnny Contardo, Frederick "Denny" Greene, Richard "Ritchie" Joffe, and Don York, plus guitarists Chris Donald, Elliot Cahn, and Henry Gross, bassist Bruce Clarke, drummer John "Jocko" Marcellino, pianists "Screamin'" Scott Simon and John "Bowzer" Bauman, and former Danny and the Juniors saxophonist Leonard Baker. Sha Na Na's big break came with a booking at the Woodstock Festival in 1969; they caught on with the public and began a string of appearances at rock & roll venues and nightclubs. Gross left for a solo career in 1970 and scored a Top Ten hit six years later with "Shannon," something his old group was never able to do; Sha Na Na was largely a live act playing on nostalgia and entertainment value, which did not translate as well on record. In spite of internal problems including nervous breakdowns and the death of member Vincent Taylor from a heroin overdose in 1974, the group peaked in popularity in the late '70s, hosting its own syndicated television show from 1977 to 1981 and appearing in the 1978 film Grease. Customer evaluation for "From The Streets Of New York - Hot Sox - Sha Na Now (2-CD)"